-John 2:18-22":Then answered the Jews and said unto him, What sign shewest thou unto us, seeing that thou doest these things?Jesus answered and said unto them, Destroy this temple, and in three days I will raise it up.Then said the Jews, Forty and six years was this temple in building, and wilt thou rear it up in three days?But he spake of the temple of his body.When therefore he was risen from the dead, his disciples remembered that he had said this unto them; and they believed the scripture, and the word which Jesus had said." From the Bible verses above, we can see that when the Jews asked Jesus for a sign, He gave them one:He told them thus: "Destroy "this" temple and that in 3 days I will to raise it again". In the same way, many people only see the physical dimension of the 911 attacks and the war in Iraq. However, there is a a spiritual dimension to these events which only few people understand. A world with the New Age view of ecumenism, a One World Global Society which would preach religious tolerance, love and brotherhood. A world in which all creeds would be acceptable. The only hindrance to the builders (Freemasons and other occult groups) constructing their new spiritual temple was the old world (old way of thinking: division under different creeds and beliefs) and that is why it was very necessary for the devil and his agents to destroy the old world. Romans 6:6: "Knowing this, that our old man is crucified with him, that the body of sin might be "destroyed", that henceforth we should not serve sin. In the same way, the masons hope that when the world of division and religious bigotry is destroyed, a new world will be erected, a world of religious unity that will usher in an Era of unity, tolerance and religious brotherhood amongst humanity. A very symbolic name given to it because a spiritual temple is currently being erected by occult groups which is intended to be a single and united temple (world order) under the rule of the devil and the so called "ascended masters". -1 Cor 5:5:"To deliver such an one unto Satan for the destruction of the flesh, that the spirit may be saved in the day of the Lord Jesus. wonders in the land of Egypt. Remember how Jesus told them to "destroy" the temple? : It was God's will that Jesus should be be killed on the Cross but who did He use to carry out the task? Satan: His arch Enemy and the human agents who satan used to carry it out. Similarly, America used the enemy that it created to accomplish its long term goal of destroying all divisions, uniting the world under one banner and showing its military might and capability to the world in order to terrify and subdue it to its ideals. “What is at stake (What America stood to gain from The gulf war) is more than one small country (Iraq: Country where the Ancient day Babel is located in: Remember it was the uniting front for the ancient builders); but about a big idea, a new world order where diverse nations are drawn together in common bonds....."
This was symbolized by the establishment of a democracy in Iraq note that the word democracy comes from 2 Greek words demo: people and cratos: power hence People Power: People's say not God's say. So the gathering of these fragments that resulted from that division is what the masons hope to accomplish and that is why they rallied all the nations to join in the fight against terrorism and the war in Iraq. Why was it called a Trade center? '1'm preety sure that the question in many of you's minds is: Why was it called the the world trade center? Why not the world order center or simply the world center to make their plan less conspicuous to the masses? The word trade implies buying and selling. The people in the divided world order were allowed to trade (distribute/sell ) ideas and that were individualistic and divisive in nature. 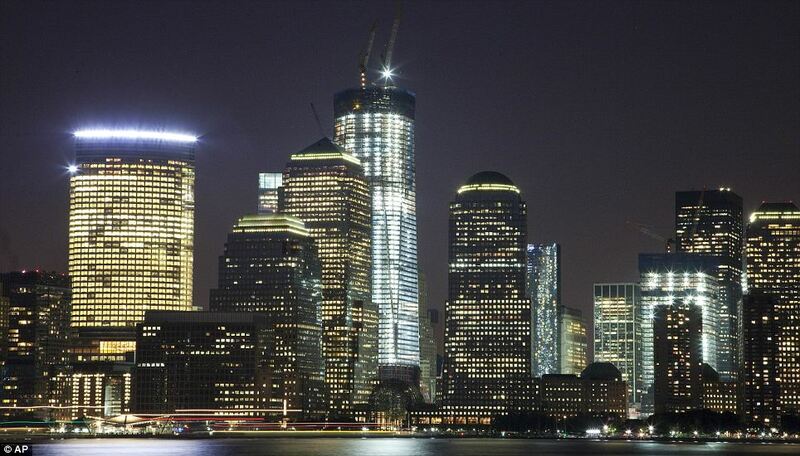 That is why it was referred to as the World trade center and comprised of 2 towers. I.e a world with no unity. The people in the new world order that is being built on the ashes of the old order are only allowed to trade ideas that are tolerant and seek the unity of the whole. That is why the false Prophet of Rev 13 demanded that no one be able to buy and sell unless they had a common mark on their right hand and forehead. The common mark represents the united consciousness that the world must conform to if they wish to make a profit from selling out their ideas to the world which is why the name of the new order is called One world trade center i.e trading singular goods i.e a world order with unity. (The people divided by different laws,creeds and beliefs) i.e the world accepts and pays for ideas that conform to the divided system. they live in or the corporations that they work for) i.e their education symbolically sells them out (when they graduate or are sufficiently educated) to be conformed to the agenda of their respective ruling powers. The old world order had unwritten laws that rewarded the merchants who sold and bought ideas that conformed people to her. On the other hand, the new world order does not reward or accept divisive and individualistic ideas. It only accepts and conforms to collective ideas and collective laws. i.e The new world order has more central and global binding laws than divisive laws. -America and our friends and allies join with all those who want peace and security in the world and 'we stand together' to win the war on terrorism. An Age of Brotherhood, Harmony, and Peace, with no divisions, that is what the New Age(new world they are building) is all about. The war was used as a tool to accomplish that aim. The two airlines that owned the planes that were used to carry out the attacks of 911 were 'American' airlines and 'United' airlines. This is symbolic of the fact that the plan for the establishment of NWO required the US (leader of the new world)to lead a world 'united' by it to destroy the old world. Also, the two sites attacked: The World trade center and the Pentagon Show that the "war"they are fighting was/is a global one. They united the world against a common enemy and thus changed the divided consciousness of the world into a united one.